Milwaukee<sup></sup> TORQUE LOCK Locking Tools provide faster tool setup and more locking force for the professional tradesmen. The patent pending thumb screw provides the user with a more convenient geometry for hand force, while providing clearance to generate more torque with the unique screwdriver through-hole design. Featuring hardened jaws for more gripping power, and forged alloy steel for maximum durability Milwaukee locking tools are made for the toughest jobsite. Milwaukee stands behind their product and offers a Limited Lifetime Warranty with all locking tools. BORA knows exactly how important it is to rigidly clamp down your case goods and other woodworking projects. Rock-solid stability means more precise work, and a finished product demonstrating expert craftsmanship and pride. Our parallel jaw clamp is the woodworking clamp that both enthusiasts and professionals reach for when working on their projects. With the perfect amount of pressure (1100 lbs./500 kg), a three 89 mm throat with padded jaw, and sizes that range from 12 to 50, it becomes an extremely versatile tool for your clamping needs. Add in the little extras that make all BORA products stand out; a passive Lock bottom jaw and large, easy-grip handle. It's almost like you designed this clamp yourself. DEWALT has a well-earned reputation for designing and manufacturing many of the world's most reliable and best-performing professional-grade power tools. And every product is forged with DEWALT's unwavering commitment to producing tools and accessories that can withstand harsh jobsite conditions and meet the unyielding day-to-day demands of professional contractors. And now, DEWALT has applied that same no-nonsense, GUARANTEED TOUGH philosophy to its new line of heavy-duty hand tools. Designed to deliver the same standard of excellence as its power tools, DEWALT hand tools were conceived on the jobsite and built to exceed the expectations of professional homebuilders, remodelling contractors, plumbers, electricians, industrial maintenance mechanics, drywall hangers, demolition crews, and all other construction trades. For added peace of mind this product is backed by a Limited lifetime warranty. Every toolbox needs a good collection of sturdy C-clamps in an array of sizes. And for quality, versatility and ease of use, this professional grade 2-inch clamp is unmatched. 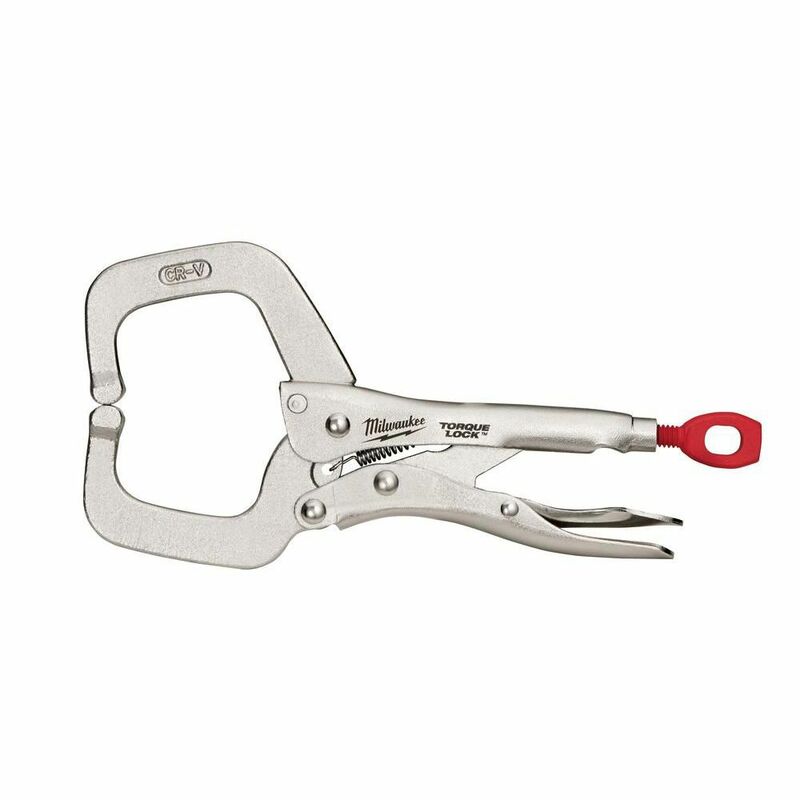 Built to withstand the rigours of heavy-duty use and enamelled from end-to-end for easy cleaning and rust resistance, this is the go-to clamp for just about any occasion or need. 6 Inch TORQUE LOCK Locking C-Clamp Regular Jaws Milwaukee<sup></sup> TORQUE LOCK Locking Tools provide faster tool setup and more locking force for the professional tradesmen. The patent pending thumb screw provides the user with a more convenient geometry for hand force, while providing clearance to generate more torque with the unique screwdriver through-hole design. Featuring hardened jaws for more gripping power, and forged alloy steel for maximum durability Milwaukee locking tools are made for the toughest jobsite. Milwaukee stands behind their product and offers a Limited Lifetime Warranty with all locking tools. 6 Inch TORQUE LOCK Locking C-Clamp Regular Jaws is rated 4.6 out of 5 by 59. Rated 5 out of 5 by CTX from Excellent quality clamps. Worth the cost. ... Excellent quality clamps. Worth the cost. Rated 4 out of 5 by NJConstructionGroup from The red adjustment is good size to make easy adjustments. Its great for steel stud framing. My on... The red adjustment is good size to make easy adjustments. Its great for steel stud framing. My only complaint is when clipped on the tool belt if it isn't really tight it has a tendency to pop loose easily when bumped. With Milwaukee tools consistent quality it's a great tool to add to the tool belt. I bought 2 of them and don't regret it.